David Sedaris, Ira Glass And 25 Years Of 'Santaland Diaries' Writer David Sedaris talks about the 25th anniversary of the radio piece that launched his career. Ira Glass, who produced it for Morning Edition, knew when he recorded it that it was special. 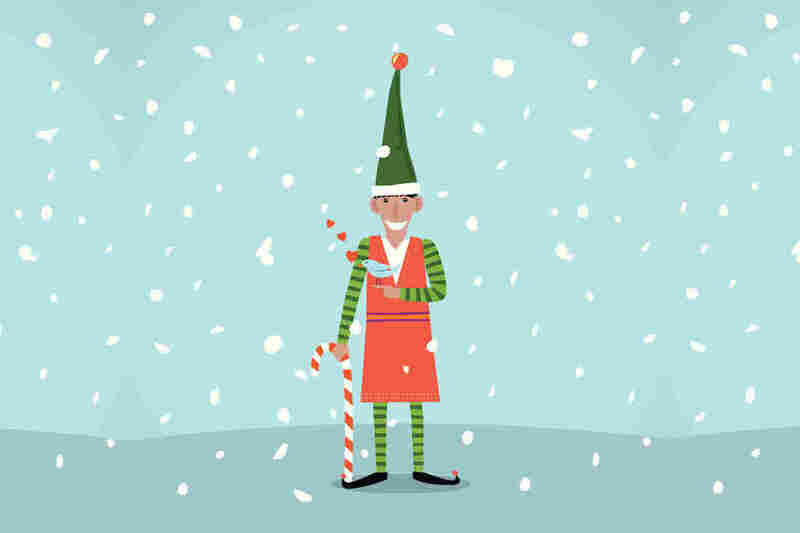 This year marks the 25th anniversary since David Sedaris' "Santaland Diaries" first aired on Morning Edition. Listen: David Sedaris Reads "Santaland Diaries"
This American Life's Ira Glass, then an independent producer, had seen him. "I ... always had thought, from the very first time I'd heard you read, 'Oh, this guy would be great on the radio,' " Glass tells Sedaris in a conversation on Morning Edition. "I was always intimidated to approach you to ask you to record it because so many of your early stories are from the point of view of somebody who is nice to people when they need them but very mean underneath. So I was just always a little scared of you." Glass recorded the original reading from NPR's New York Bureau. And as Sedaris read it, Glass says he knew it was something special. "I remember we got to the part where you sing like Billie Holiday — and I had no idea that you were just going to like break out into song and sound exactly like Billie Holiday," Glass says. "I was a pretty experienced radio producer at that point, and I was like, 'This is a good one.' "
For Sedaris, then 35, the response was life changing. "Just immediately after it ended my phone started ringing with opportunities," he tells Glass. And because his name was in the phone book, he says he got all kinds of calls – from editors, old friends and from strangers, including a telephone operator. "She was late for work because she sitting in her car listening to it. And then she went into the phone company to start her job and she called me." That 1992 reading on Morning Edition was "like someone had flipped a switch," he says. "and they said OK the second part of your life is going to start in 7 minutes. So just get ready." Morning Edition airs the reading every year, and for many, hearing Sedaris as Crumpet the elf has itself become a holiday tradition. "I realize you're lucky if you have one thing that people appreciate, you are a lucky, lucky person," Sedaris says.